Newer PostFitness Scammers Are Helping the Industry? I’m a sucker for innovation and while I wouldn’t say Caffeine Bullet is truly innovative (there are other similar products on the market), I’ll give it to them for coming to market with a solution that solves an issue that many endurance athletes face. Athletes are always looking for a competitive edge and being able to have a rapid delivery system is obviously advantageous when in the heat of an athletic competition. Created by David Hellard, a marathon and ultra-marathon running champion, Caffeine Bullet provides individuals with not only 100mg of caffeine per serving but also electrolytes as well. 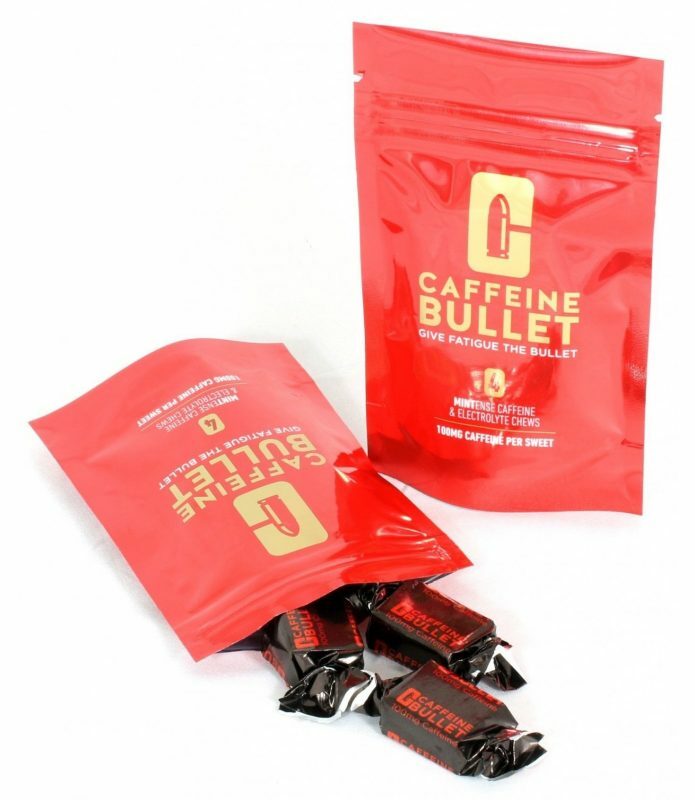 Each package of Caffeine Bullet contains four chews for a total of 400mg of caffeine. The purpose behind having four per package I am assuming is to allow athletes to carry Caffeine Bullet with them (such as in a pocket if you are a runner) and grab one as needed to provide a boost of energy and recovery. The downside is that many athletes these days consume products such as stimulants for training and 100mg (per serving) really isn’t going to do much in terms of an ergogenic aid. I mean, for me personally, I could eat the entire package (400mg) and go right to bed. 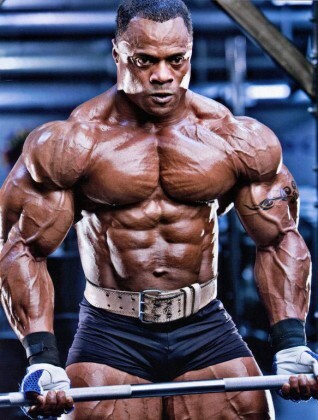 But then again, my adrenals are shot thanks to the stimulant-heavy products found in the supplement industry. So, maybe I’m not the best example. Your mileage may vary. Now, the one thing that has me saying “eh” about the product is the flavor. If I were playing a sport and was going to quick chew something, I would want something that provides a sweet flavor – that’s just me, but I have a feeling others would tend to agree. 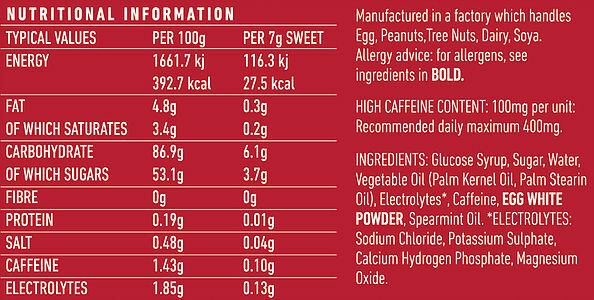 The Caffeine Bullet was launched in, of all things, a mint flavor. Maybe following a workout I might consider a mint flavor or maybe even after a meal to help freshen your breath but during a competition? When digging deeper into what he is saying, it makes a lot of sense. Clearly there are Ironman races that are held in the states, but even more importantly, think about all of the endurance races that we have in the United States on an almost weekly basis. It seems like every weekend there is some sort of endurance race being held for Tough Mudder, Zombie Races, Spartan, etc. 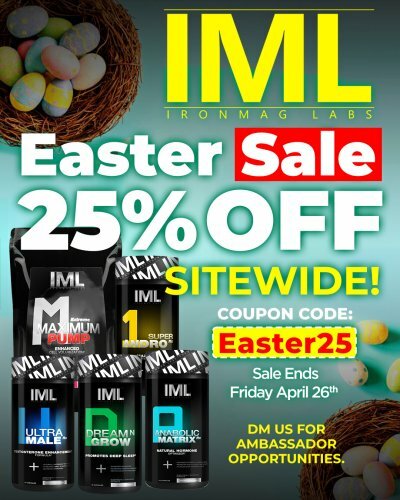 That is a HUGE market that they can tap into and if they were smart, they may want to consider sponsoring some of the events and races to help get initial trial on Caffeine Bullet and help build brand awareness. It’s honestly going to be an uphill battle for Caffeine Bullet though, they are competing against other recovery and energy products such as Gatorade chews, caffeine gum, PowerBar gels, Clif energy gels, 5-hour Energy, etc. The energy market is super saturated and it’s going to be tough to have people change their buying behaviors when what they have been using was probably working for them. If athletes can truly get Caffeine Bullet into their bloodstream in as little as five minutes (as claimed by Hellard), that could absolutely give them a competitive edge. With most products taking 25 minutes or longer, that could actually be too far out to truly make a difference when minutes matter. With something that takes longer, you’d almost need to plan when you should drink or consume a product so that you’ll get a boost when and where you need it. On the flipside, with Caffeine Bullet, when you start feeling fatigued you can simply eat one of the chews (or more depending on your tolerance to caffeine) and in as little as five minutes feel a noticeable difference. Personally, I think it’s a pretty cool idea and can see people and athletes giving it a try. Is It JUST for Athletes? We live in the US. Look around you. Energy drinks. Coffee. Soda. 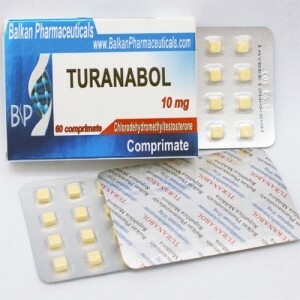 We have no issue putting down stimulants in our everyday lives. I can see normal people (non-athletes) using Caffeine Bullet throughout the day when they need a pick-me-up. It could be a mid-afternoon boost they need to finish the day strong or even used as a pre-workout. The ability to take it and feel the effects in five minutes means you wouldn’t have to plan your pre-workout 15-30 minutes in advance. You can take Caffeine Bullet right before your warm up and as soon as you’re done you should already be feeling the boost in energy. Overall, Caffeine Bullet is pretty cool, in my opinion. Is this something you would consider trying for yourself whether it be for athletics or a quick jolt of energy during the day? Let us know in the comments. Culliney, K. “Caffeine sports new startup to launch into US – It’s the ‘main endurance market in the world’.” NutraIngredients USA. 2019.